Bright apartment on the sea front of Tamariu's beach. It has a large living room with a balcony over the Passeig del Mar. There are two bathrooms and three bedrooms. Thanks to its location, it is perfect to enjoy the beach at one hundred percent. Flat of approximately 100 m2 with 3 bedrooms, one of them has a king sized bed and the other two have twin and bunk beds. It has a large living-dining room with wall-to-wall windows that allow the entry of light and sun during part of the big day. These windows separate the dining room from a large balcony-terrace that face the street. The flat also has a full bathroom with shower and a toilette for best convenience. There is a very comfortable kitchen, with oven, microwave and a really equipped cooking-tool set. At the end of the hallway there is a staircase that lead you to a large and airy open space pertaining to the building, where you can put out the clothes to dry or sunbathe with total tranquility. Public parking lot at the end of the street. 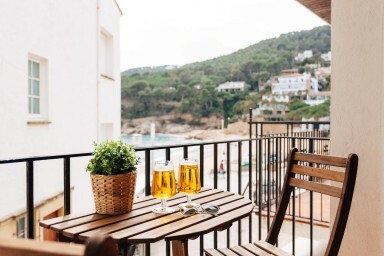 In Tamariu there are two supermarkets, typical and charming restaurants on the beach, shops and summer clothing accessories, hairdresser, two bakeries, a diving center and a small agency that rents boats to explore the surrounding coves. On the date of departure, it is important for you to wash your dishes, take the garbage away (there are public containers on the square of Tamariu's main road), turn off all lights and electric devices, leave the keys on the dining table and close the door behind you when you walk out. Nice apartment on a good location with a view on the bay. Supermooi kleinschalig dorpje, leuk strandje.